At the beginning of every new school year I ask my students to fill out a form regarding how they feel about math and science. More often than not I receive a lot of negative feedback. As a teacher you need to promote the creativity and problem solving skills that are associated with math and science daily. Every child that enters your classroom at the beginning of the year needs to leave at the end as a mathematician and scientist. They need to see that these two subjects surround them in everyday life. Here is a list of read alouds I like to incorporate throughout the year to promote growth mindset in these subject areas. 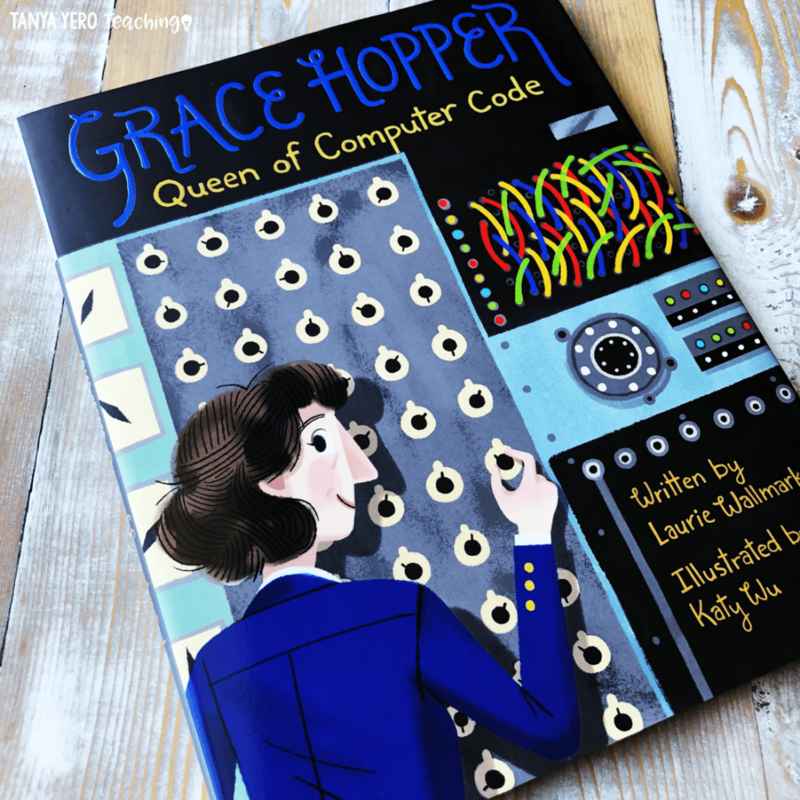 This book covers the story of Grace Hopper and her journeys in the U.S. Navy during World War II as a computer programmer. 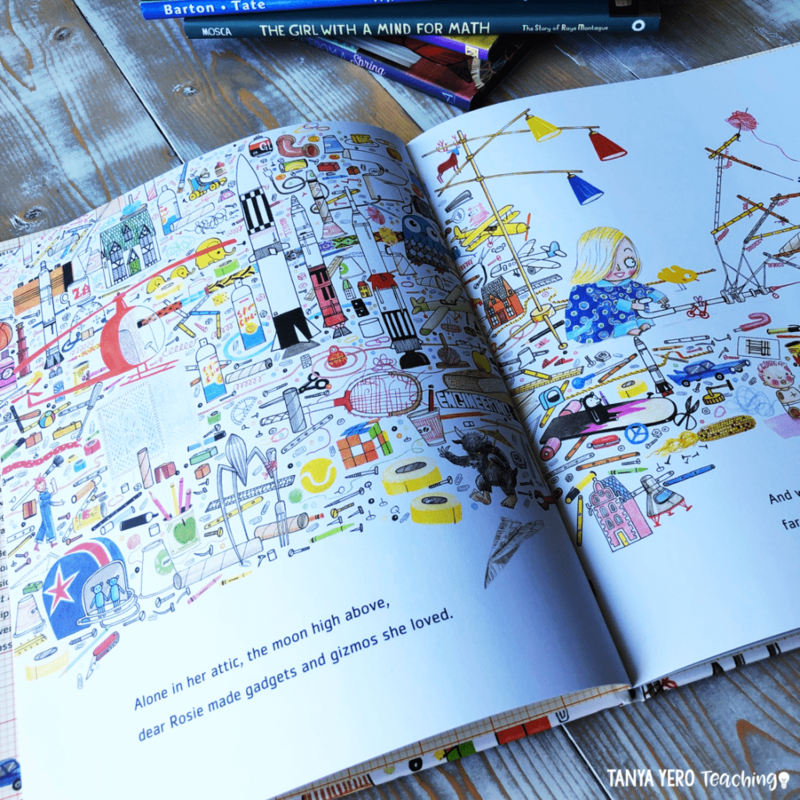 The illustrations are just as bright and warming as the story. 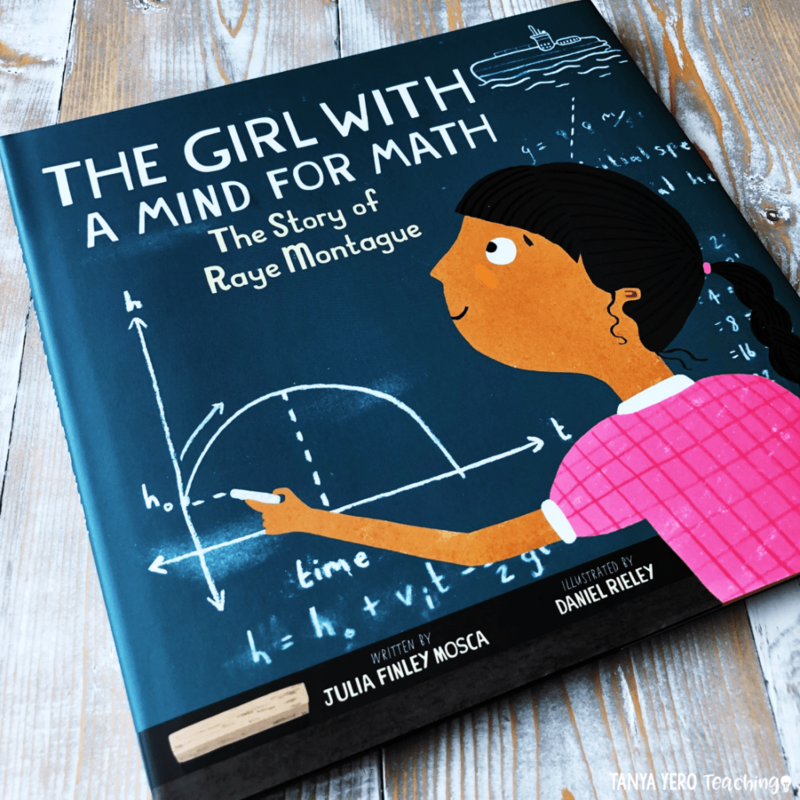 Build up the female students in your classroom with this inspiring story about Raye Montague. This book highlights the struggles Montague faced and how she overcame those obstacles. I read this book EVERY year during the first week of school. It’s a great way to start a discussion about math surrounding us in every day life. And…it’s just adorable. 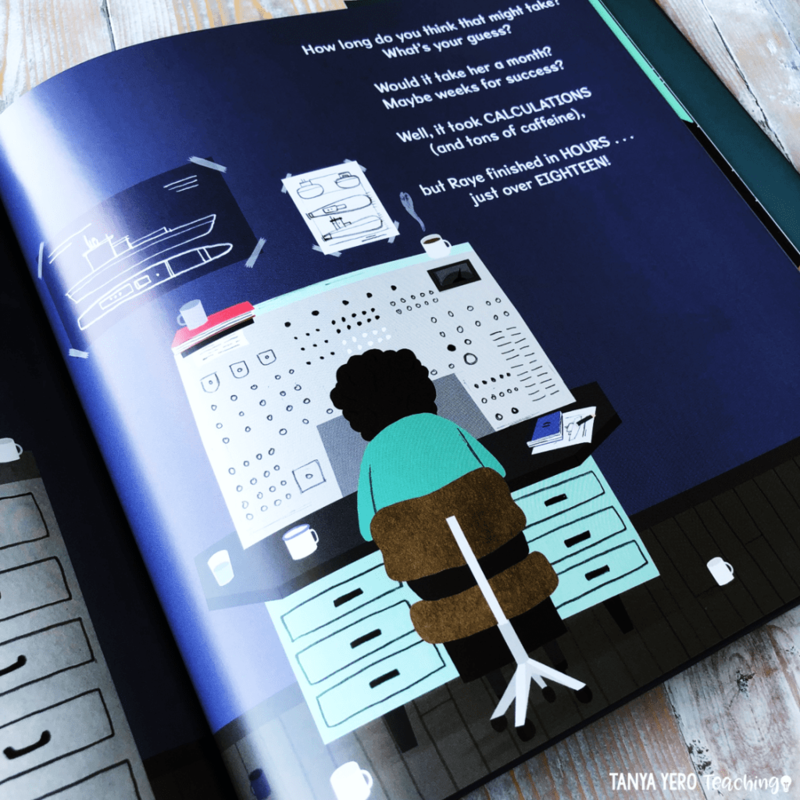 The main character wakes up one morning to find he’s been cursed with the gift of seeing math in every little aspect of his life. 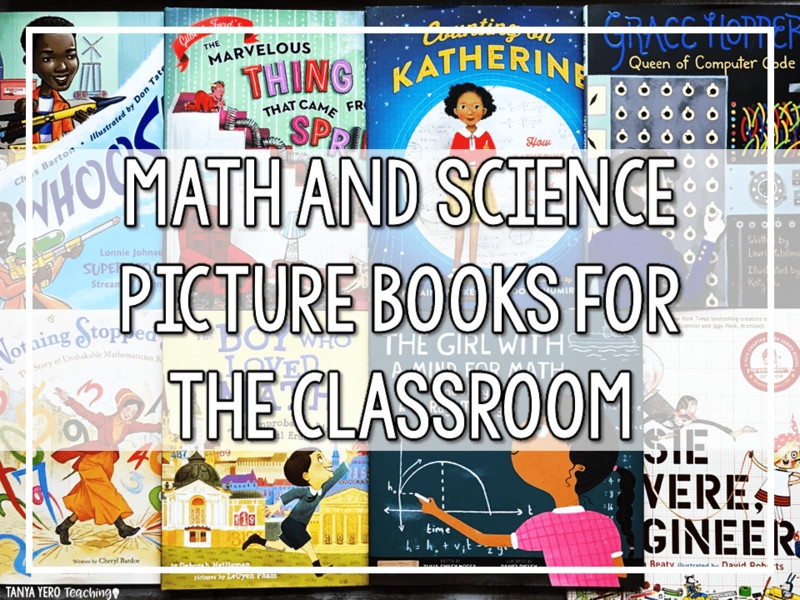 Your students will love this book! 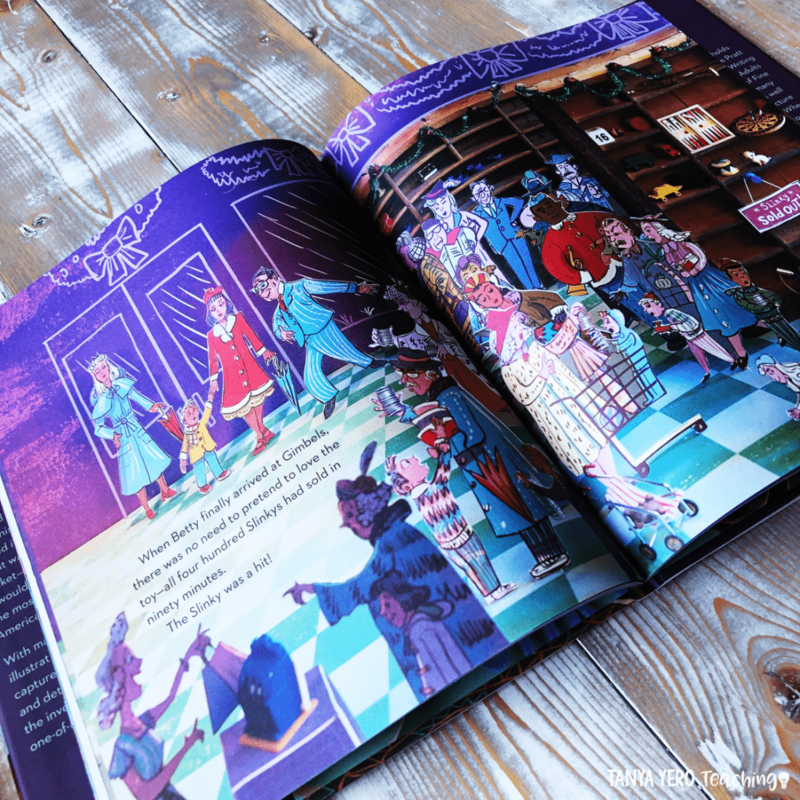 The illustrations in this book are breathtaking! Layers are built upon one another to make the illustrations pop and look lifelike. Your students will love reading about Richard James and his accidental discovery of the Slinky. This story is incredible. It’s the true story of Sophie Germain and her fight to be respected in the male dominated eighteenth-century. She was the first woman to win a grand prize from France’s Academy of Science for her formula. 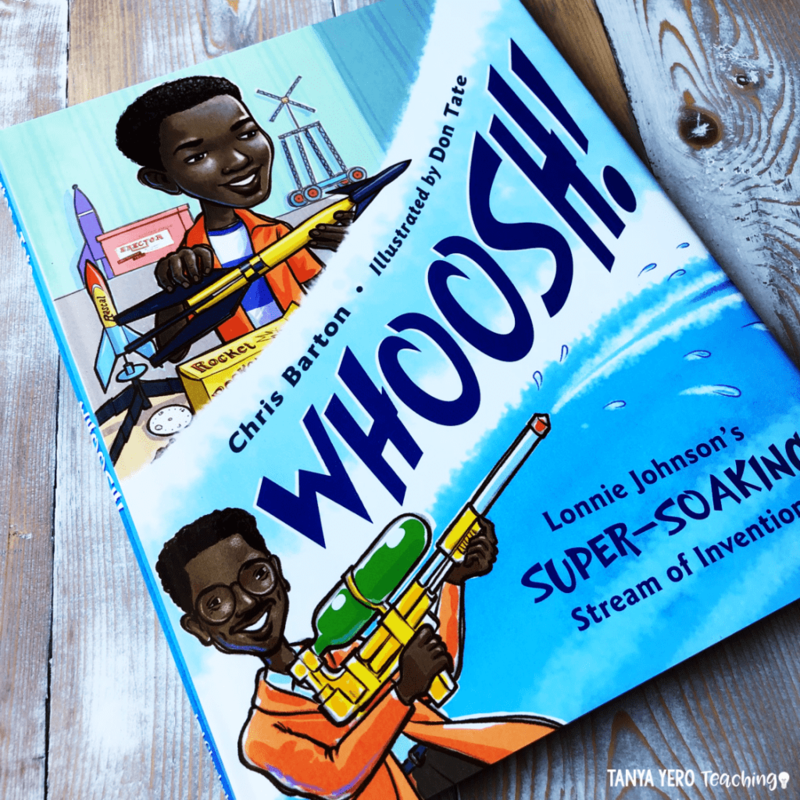 Another story of an accidental invention, this book is about Lonnie Johnson, a child that was passionate about problem solving and discovery. 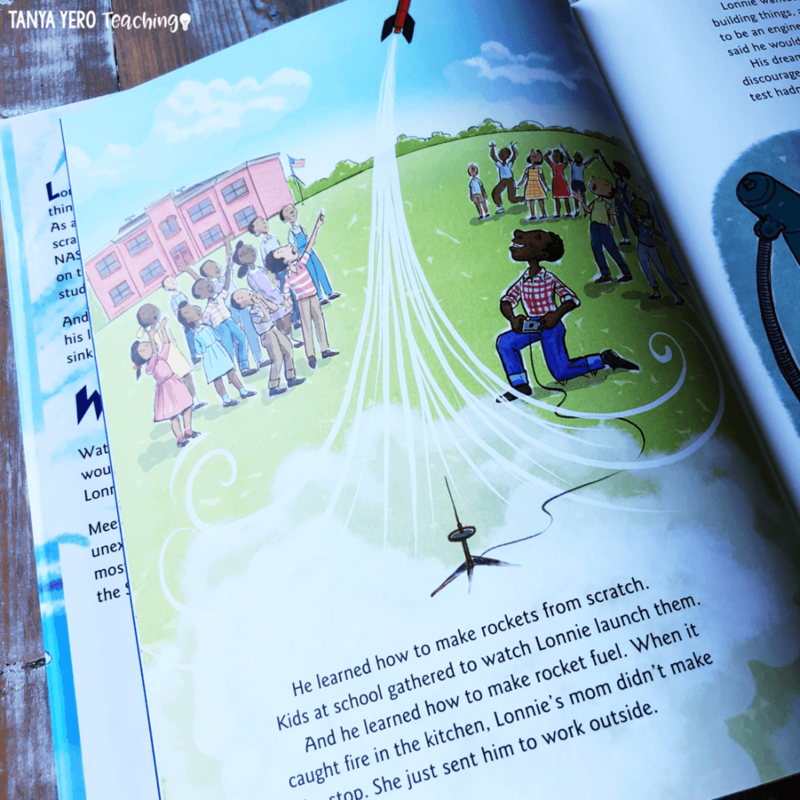 This book covers Lonnie’s journey to becoming an engineer and eventually working with NASA. 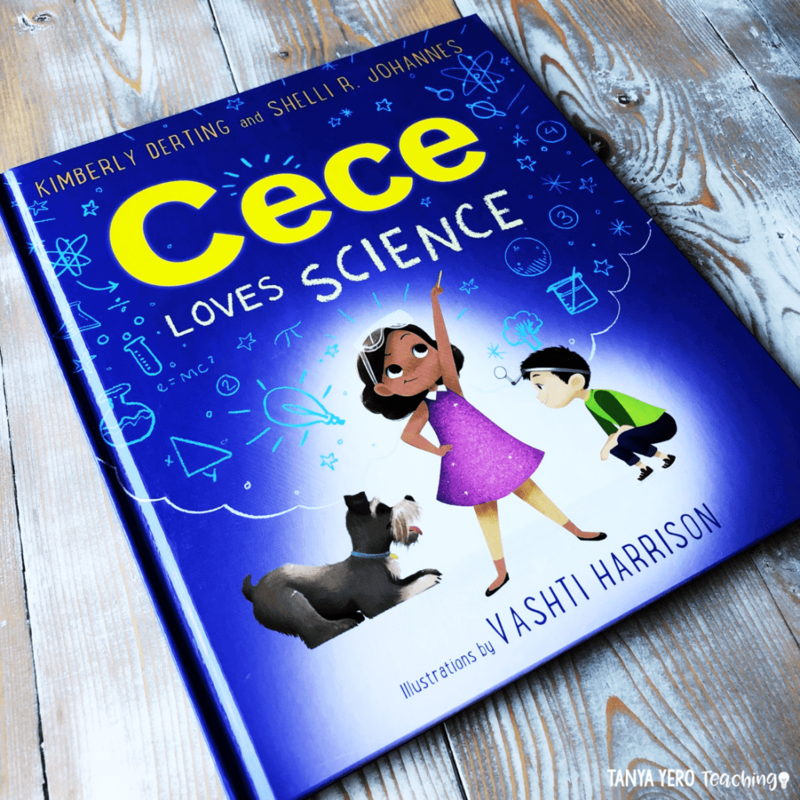 There is no true story here, just a feel good story about a young girl that loves science and exploration. This book would be perfect for the first week of school. 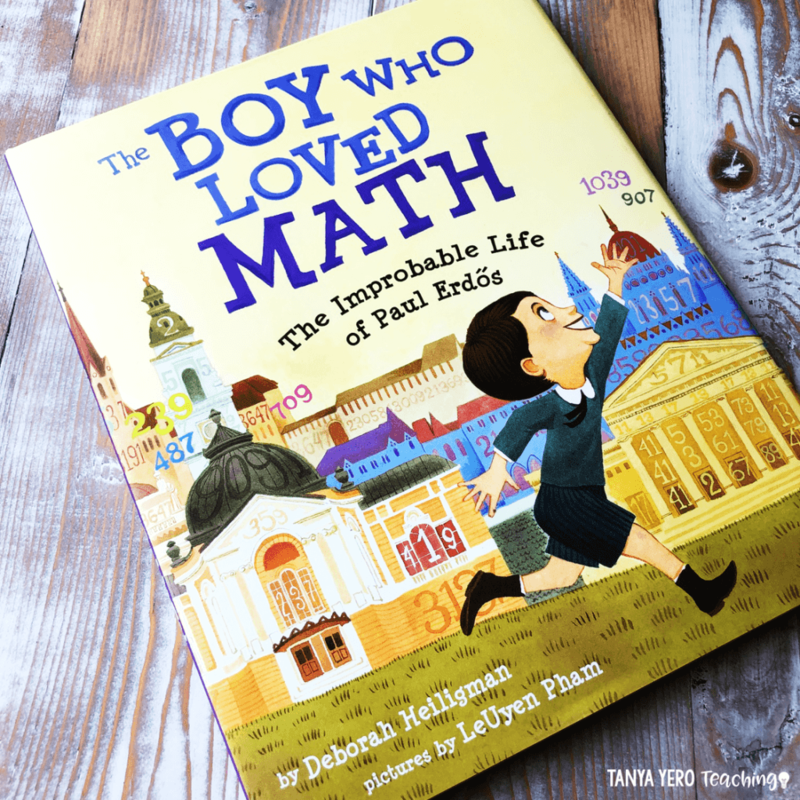 This book is about the inspiring story of Paul Erdos and his love of math. 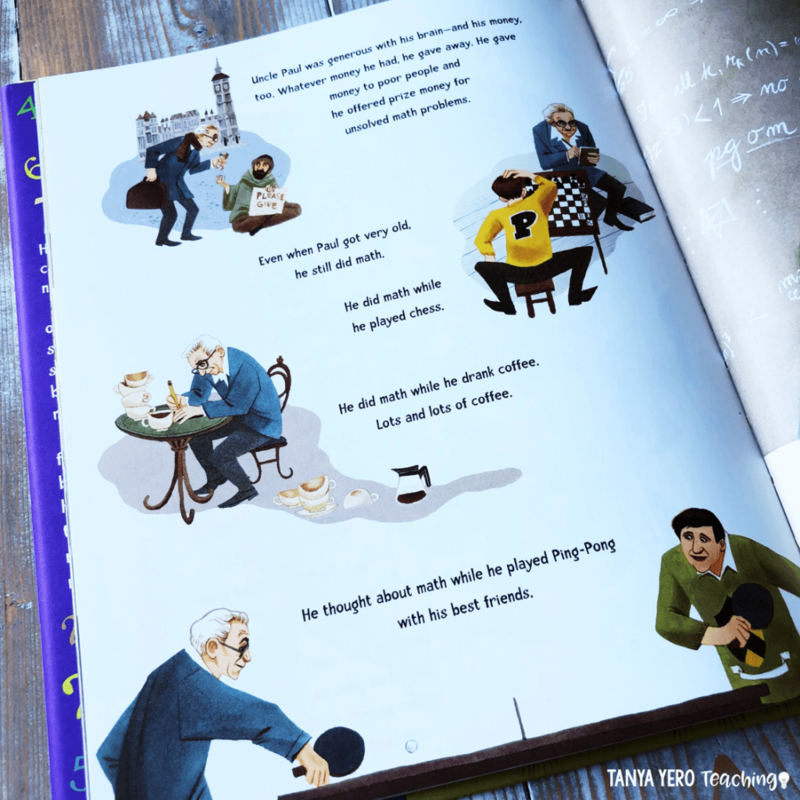 He would travel around the world and collaborate with other mathematicians. 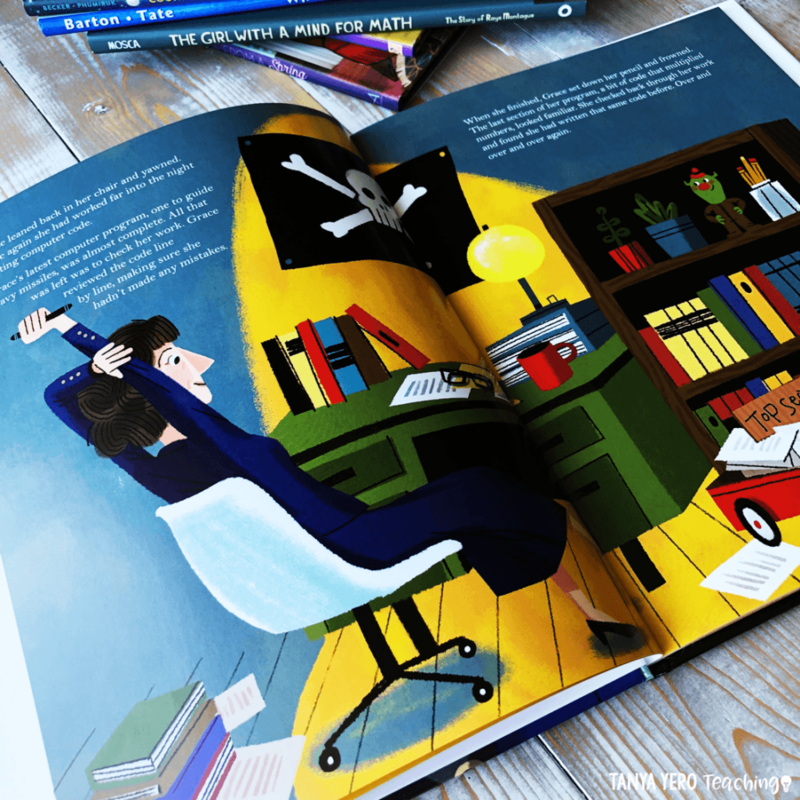 Your students will love the theme of grit in this story. 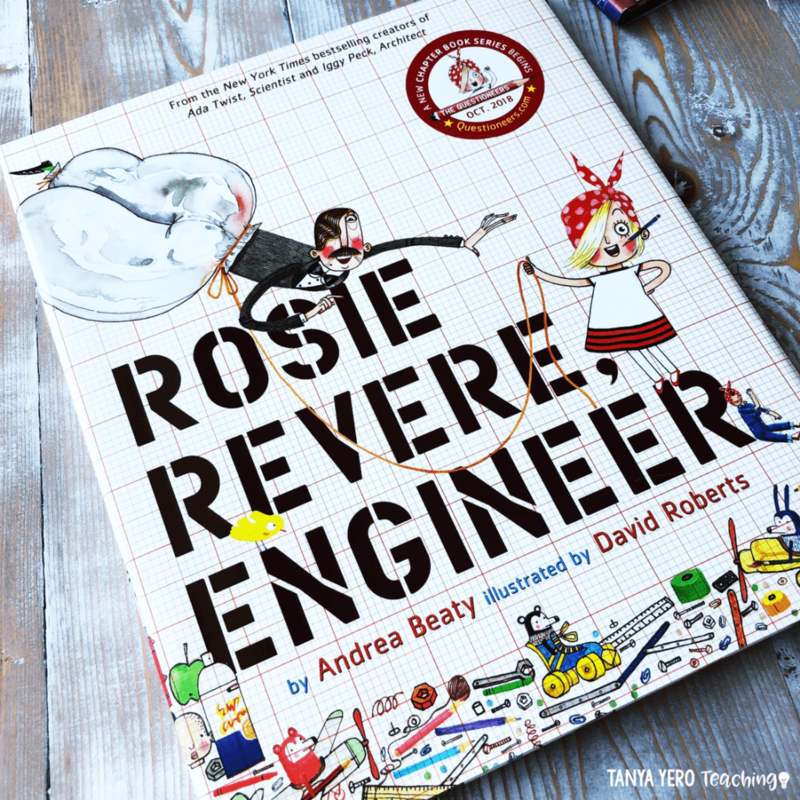 This book is one in a series about children dreaming about becoming architects, engineers, scientists, and more. 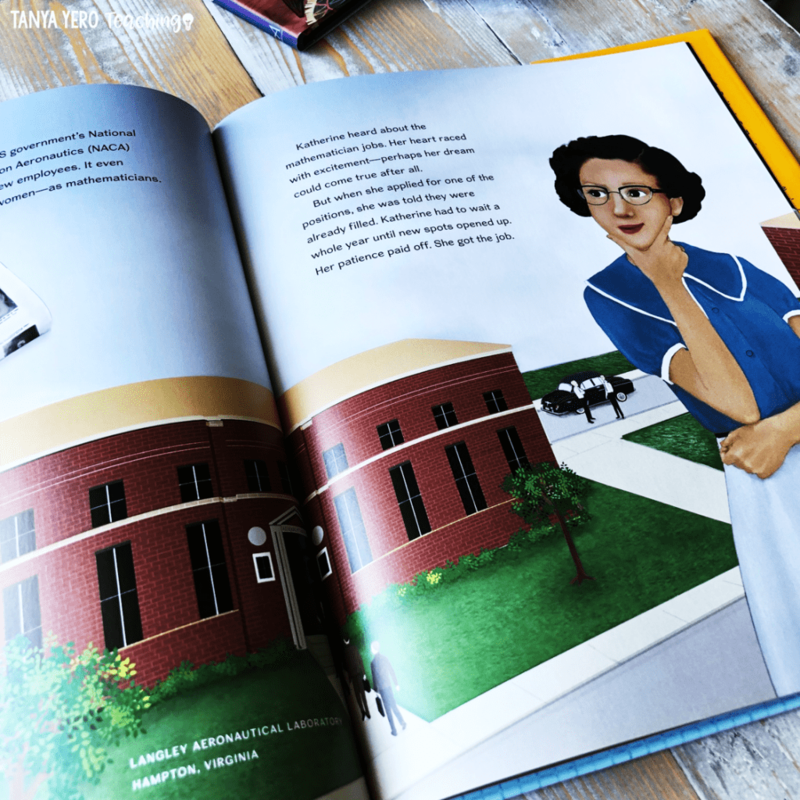 The illustrations are eye-catching and the stories portray a strong message of perseverance and dreaming big. 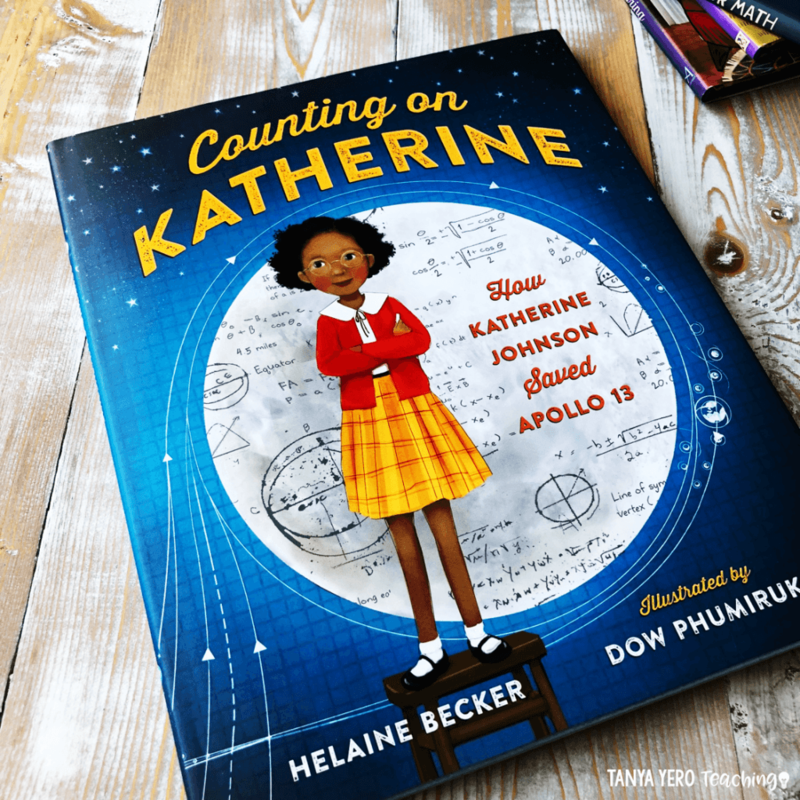 Most students are familiar with the Disney movie “Hidden Figures.” Bring the true story of Katherine Johnson into your classroom with this book. 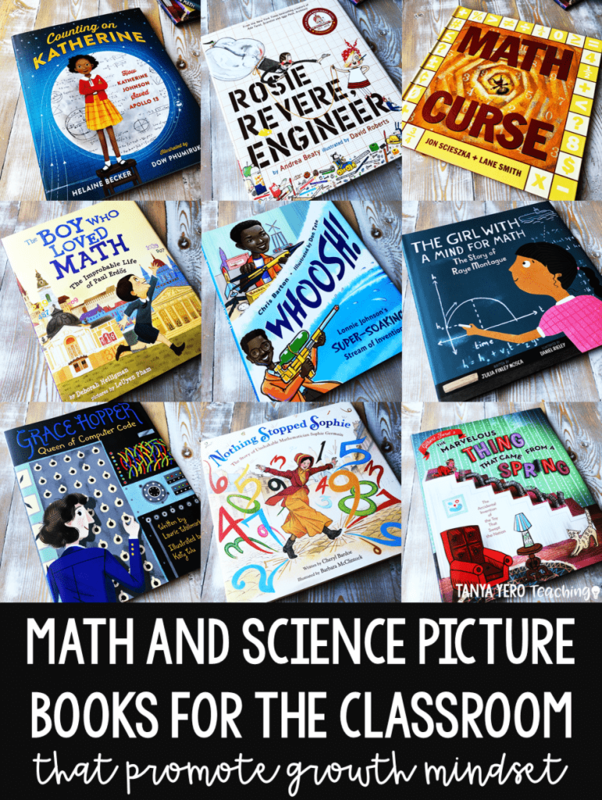 What are your favorite math and science picture books? 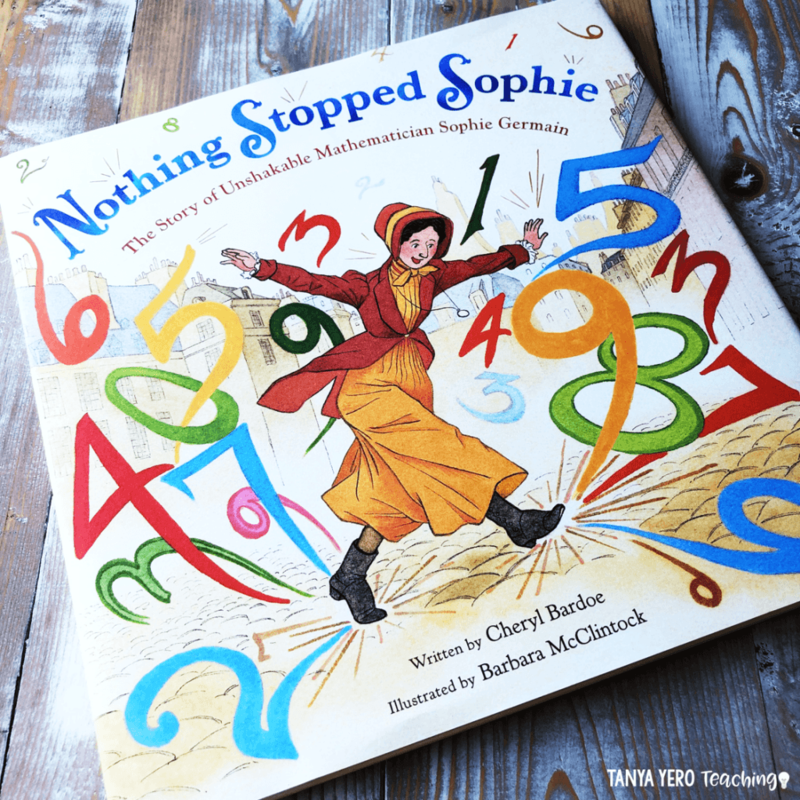 One of the foundations for understanding mathematics for students is knowing and recognizing the differences between single-digit numbers, teen numbers, and multiples of ten. As an adult, this concept seems very simple, but it must be explicitly taught to our youngsters in order for them to be able to apply the concept later in their math careers. This is a great opportunity to bring out your base-ten blocks. 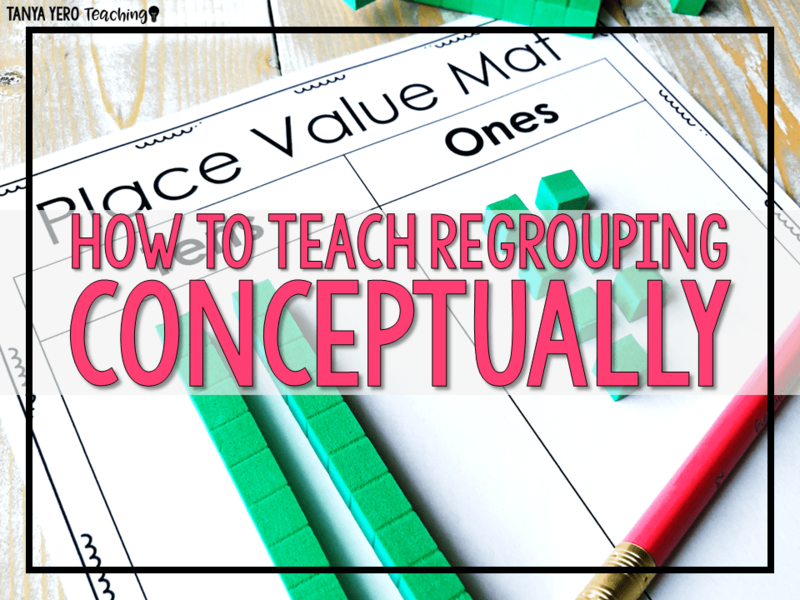 You will want to have a stockpile of them so that your students can work in small groups and even partnerships to promote discussion during this crucial learning time. On the first day of instruction, show the students the ones blocks. You can gather them in a group or use a document camera to show them the block. Tell them you are going to count together to 100 using the ones blocks (only). Have them choral count with you to twenty or so, bringing in one more block for each number. You may start acting fatigued because it is taking so long to count by ones. Have a group discussion about how long it would take to count to 100 using only those tiny little blocks and see if they have any ideas. You can ask some prompting questions, or just let their ideas flow. This is when the magic happens and you introduce our friend, the tens rod. Have a couple of students come up to examine the tens rod to make sure that it is indeed composed of ten little blocks. Line up ten ones blocks next to the rod so that they can see that they are an equal amount. You may even have them give you a “thumbs up” if they agree that they are equal and we could count using those instead. What do they remind you of? What is a more fun name for this? Most kids come up with French fries for tens and tater-tots for ones. Some even come up with cheese sticks and cheese cubes. It will depend on your class, but make a list that is visible for everyone and tell them that the next day, they will take a vote on the names that they’ll use for the manipulatives in class. My students prefer to use cheese cubes and French fries, which does not make sense to me since they aren’t even in the same food group, but they don’t have any problems transforming cheese into potatoes, so let the imaginations run wild! On the second day, kick off your lesson with a really exciting class vote on what to call your ones cubes and ten rods. This will help with the vocabulary moving forward because it can be confusing for kids to hear and understand the statement “Let’s trade in 10 ones blocks for a ten rod.” It’s much easier for them to understand and picture “Let’s trade in 10 cheese cubes for a cheese stick.” The image they create in their minds is much clearer, which helps them in the long run. I was pretty hesitant at first to provide the students with an alternative name for these manipulatives because I wanted them to know what they represented rather than just a cute substitution, but it really works! Note that you will not always refer to these manipulatives by the voted-on name, but it provides them with the mental image that they need moving forward. After voting on names for your manipulatives, introduce your students to a place value mat. 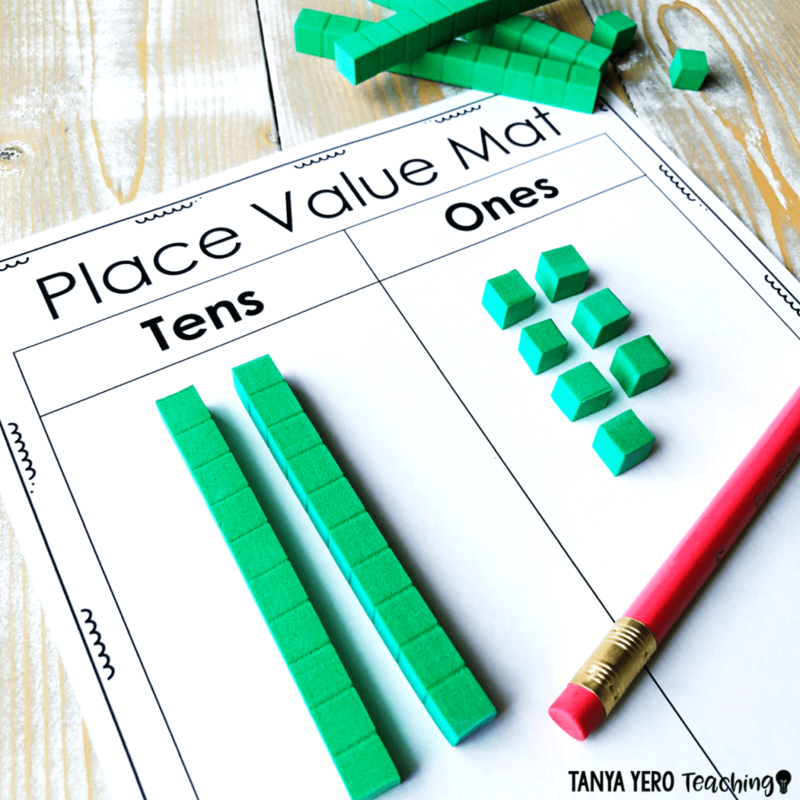 Most mats use three place values, but for the purpose of this lesson, you should use mats with two place values (tens and ones). I refer to the two place value columns as “houses” and use the language that each manipulative “lives” in its own house; they cannot share. This prepares them for trading ones for tens and for adding and subtracting using manipulatives. Which is worth more – a cheese cube or a cheese stick? How do you know? Where would we put the “cheese cubes” and where would we put the “cheese stick”? Why would we put them in that order? What could we do if we have too many cheese cubes in the house? Eventually, you want your students to come to the conclusion that the tens go on the left and ones go on the right. End this lesson by writing a couple of single-digit numbers on the board and having the students demonstrate with their manipulatives how much that is. For example, if you write the number 8 on the board, the students should count out 8 “cheese cubes” into their “cheese cube house”. Begin this lesson with a review of the name the class chose for the manipulatives and another single-digit practice number on the board. Today, you will introduce the students to using the manipulatives and place value mat for counting teen numbers. Give each student a “cheese stick” and 19 “cheese cubes” to start the lesson along with their place value mat. Write a teen number on the board and demonstrate how to build it, counting one block at a time until you get to the number. Ask the students what you could trade in 10 “cheese cubes” for now. They should exclaim “cheese stick” (or whatever name they gave to the ten rod). Go ahead and trade the 10 blocks for a rod, lining them up next to each other so they can see. Allow them to also count how many “cheese cubes” are left in the ones column along with how many “cheese sticks” are in the tens column. Give students multiple opportunities to practice this activity with different teen numbers. After a few trials, see if they recognize the pattern of having one “cheese stick” every time there is a teen number. Prompt them to start with the “cheese stick” counting it as ten and then counting on to finish the teen number. You may need to model this a couple of times before they are ready to try it. To end the lesson, model a few teen numbers using the manipulatives and have the students determine what number you created. For example, if you model one “cheese stick” and 5 “cheese cubes”, the students should be able to say that you made the number 15. Try this a few times to see if they can recognize that the “cheese stick” is worth 10 and they can count on to make the teen number. Begin this lesson with another review of what they did in the previous lesson. Provide modeled examples of teen numbers as well as writing teen numbers to allow them to create the model with their manipulatives. Continue to use the terms they voted on and interchange those terms with the mathematical terms (ones and tens). Now for the fun part… Introduce a game called “Trade Up” to the students. This game can be played individually or in pairs. It is usually more fun to start out in pairs for this game, and it requires fewer materials, which is an extra bonus. Give each student their own place value mat, 2 ten rods, and 15 ones blocks. (I give them 15 ones blocks so that if they have 9 ones and roll a 6, they can build the number before trading in 10). Give each pair one 6-sided die. The pair will take turns rolling their die and putting that many ones blocks on their place value mat. When they reach 10 (or more), they should trade up for a tens rod. Their goal is to make it to 20 before their partner. 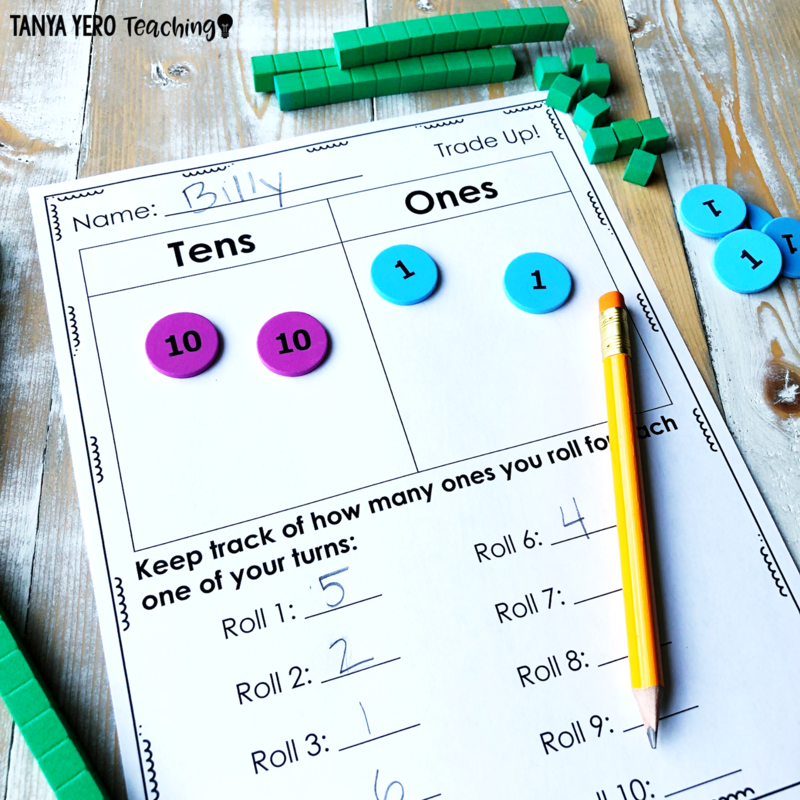 Of course, this is really a game of luck, but it does provide a little more fun to their practice of counting and trading ones for tens, which will help them in the long run. This game can be played fairly quickly once your students get the hang of it. You can turn it into a tournament, where the pairs keep track of how many “Trade Up” games they have won with tally marks. For students who do not do well with competition, I have them compete against themselves to see how few rolls they can have to make 20 or have them time themselves when they really get fluent with the process. Another thing I love about this game is that it is very easy to differentiate. 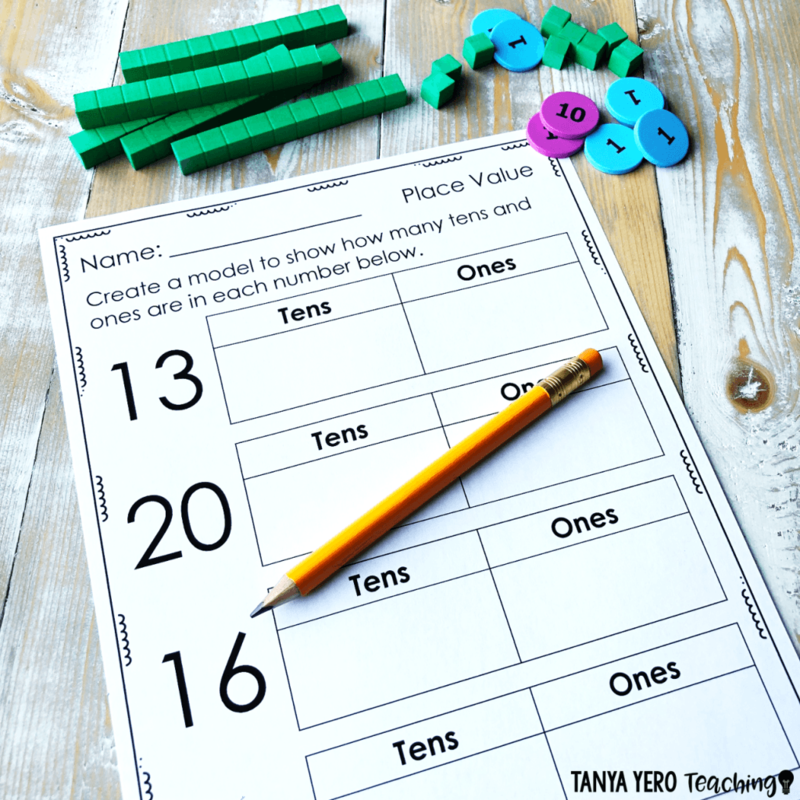 For students who are having a difficult time counting up and trading, you can provide a ten-frame within the place value chart. This way, they know that when the ten-frame is full, they should trade for a rod. Remind them that rods live in the “cheese stick” house and not in the “cheese cube” house. For students who master this fairly quickly, you can have them trade up to a higher number. Just make sure they have enough tens rods to continue to trade up to that number. I suggest having them trade up to 50 to start with. 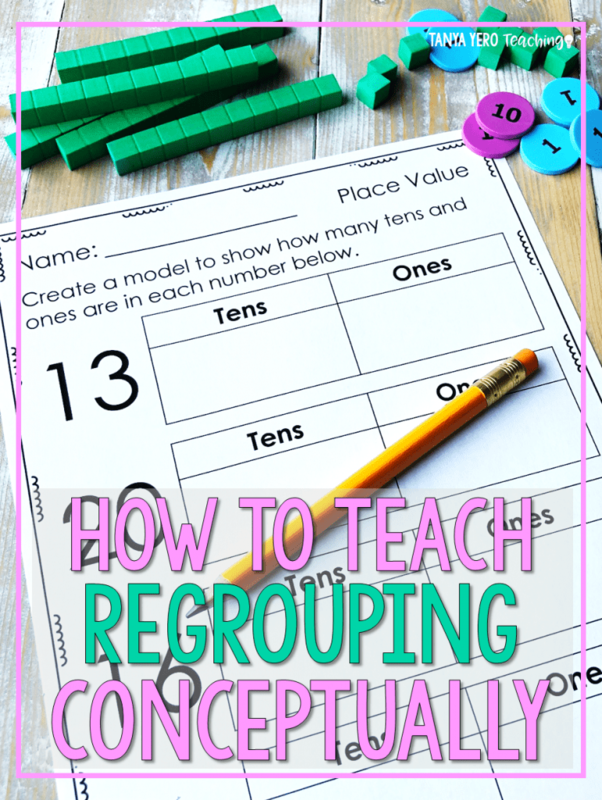 As your students progress, this type of activity can be used to help them count by tens, add and subtract double-digit numbers, and the list can go on. Sign up below for your FREE templates that are pictured in this blog post! SIGN UP FOR YOUR FREE RESOURCE! SUBSCRIBE NOW TO OUR NEWSLETTER TO RECEIVE YOUR FREE PRINTABLES! Success! Now check your email to confirm your subscription. YOU'RE SO CLOSE TO YOUR FREE MATH ACTIVITY! 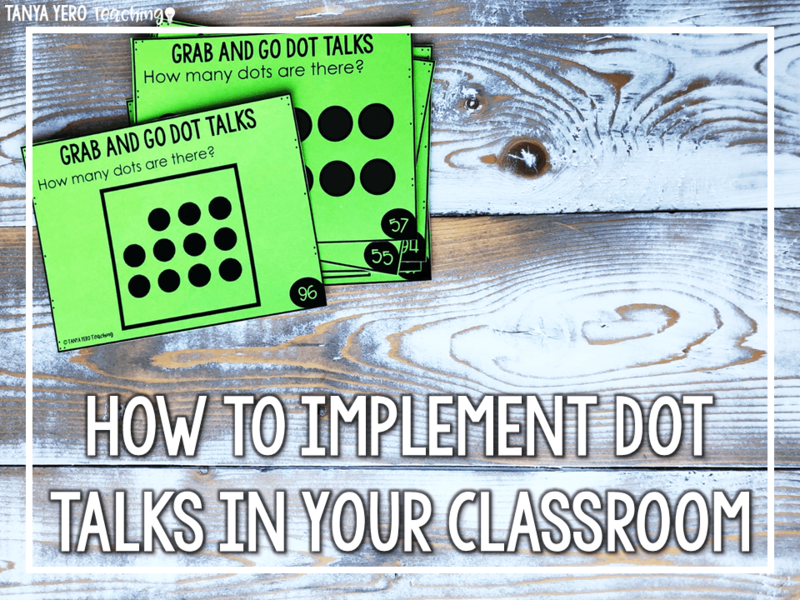 Dot talks are an off-shoot of the daily classroom number concepts called “number talks.” Dot talks can be incorporated into number talks, and can be used with students of any age. But because subitizing is such an important developmental skill, they are uniquely suited to meeting the needs of kindergarten minds. Subitizing is the ability to look at a number of objects and “know” how many there are. Some subitizing is perceptual, such as when we recognize this pattern of dots on a die as five. Conceptual subitizing is recognizing smaller sets within a larger number of items and quickly adding them together. Looking at the 6 side on a die, we see 3 and 3, which we know is 6. Dot talks are short, routine class meetings that help children build number sense, articulate their thinking, and appreciate different perspectives. They should be scheduled as a regular part of your day and flexible enough to expand with the children in your class or group. When dot talks are first implemented, especially if it is early kindergarten, they will take only a few minutes. Later on, as children learn the process, build their skills, and develop confidence, you may be struggling to keep it under 20 minutes. Beginning training for dot talks is almost painfully simple. You present a card with 1 dot on it for a moment, and ask the students, “How many dots are there?” They will see 1 dot and can prove their thinking by touching the dot and counting, “one.” You can vary this first lesson by presenting dots in different places around the page or card. This fosters the additional critical understanding that sets can change shape or orientation, but only change if something is added or taken away. 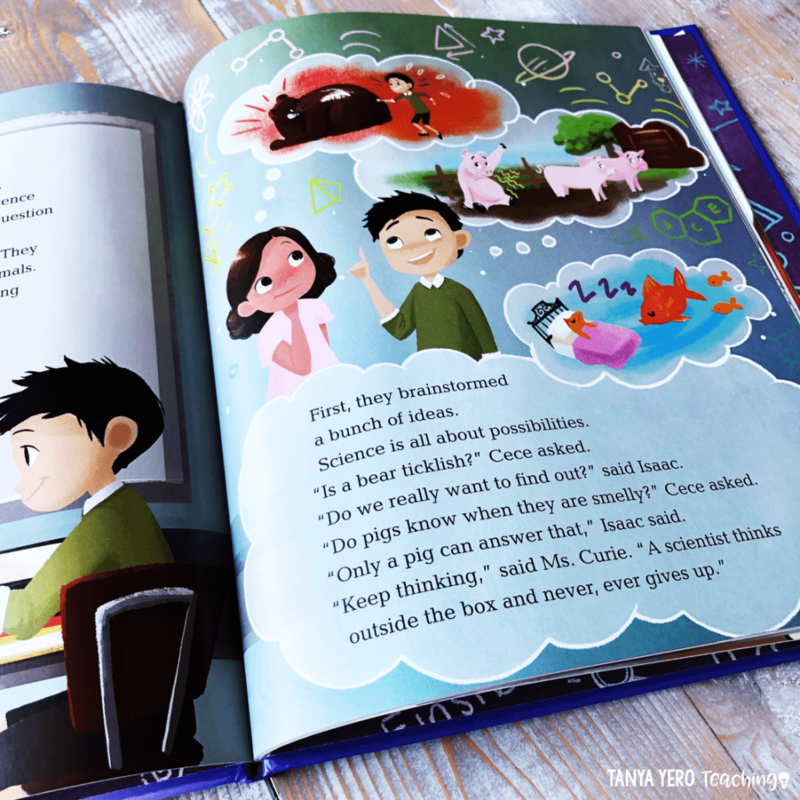 What Do Dot Talks Look Like In The Classroom? How many dots are there? Hold the dot card up briefly. Students look at the card, but don’t count the dots (of course, they will in the beginning). Ask, “How many dots are there?” Record or discuss students’ observations. Follow up with, “How do you see them?” Students will explain how they saw groups that they added up to the whole. Dot talks start out very simple! Your students are learning how to do Dot Talks and learning how to complete the question-answer process. 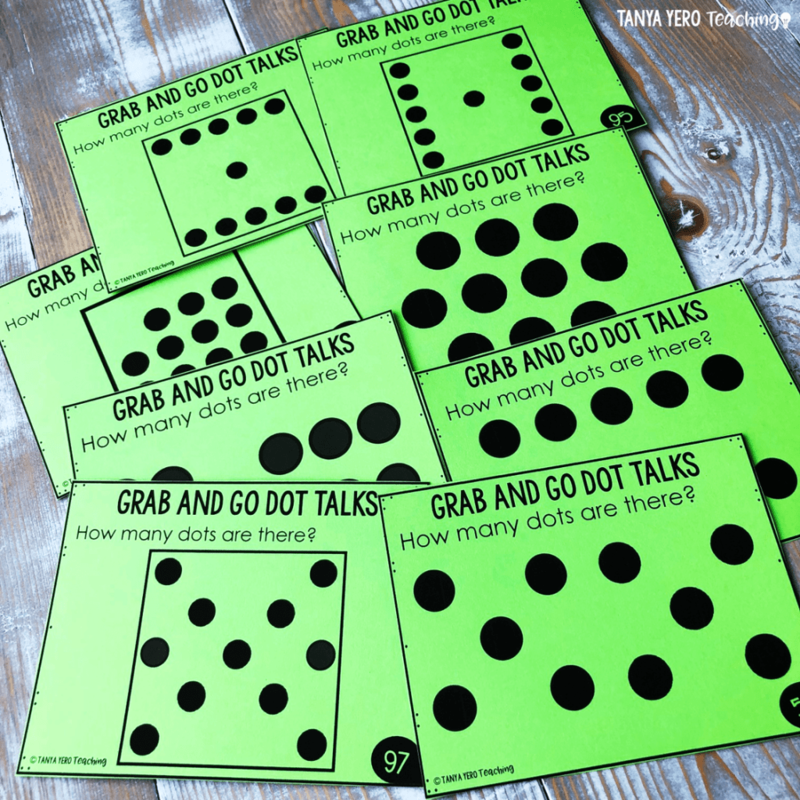 Over time, as the numbers get more complex and the children develop their skills, a single dot talk card can take as long as 15 minutes to complete! Dot talks for 1, 2, and 3 dots can be used for training your class in the process. You will model strategies, self-talk, and reasoning aloud. Early on, each number can be presented in a variety of arrangements so children can experience a variety of strategies. You can certainly buy specially made dot-talk cards. In the beginning, it is also easy to use a marker and an index card! Which number doesn’t belong? Starting this activity early on is great, because the visual representation is easy to differentiate in small sets. For example, the difference between 2 dots and 4 dots is clear. This activity requires a set of 4 cards. 3 of the cards have the same number of dots. 1 card is different. Children briefly look at each card, and then it is flipped. Children “see” the difference by subitizing the dots on each card. Children share their thinking and how they knew which card didn’t belong. 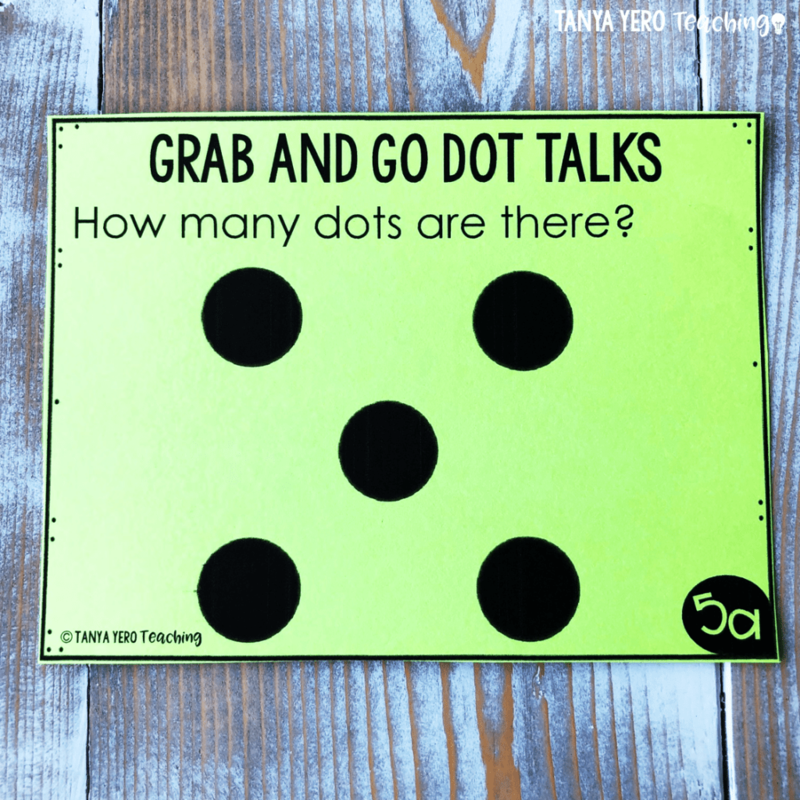 This activity quickly builds confidence in young learners, which in turn builds excitement for dot talks, and math in general. How did the number change? This activity is presented in sets of 2 cards each. Children look at the first card briefly. The card is flipped, and a different number of dots is displayed. Children explain how the number changed. For example, there may be a new dot on the 2nd card. One dot may have been subtracted. Again, children rely on subitizing to come up with the answer and develop their reasoning/articulation skills through the reporting process. This activity supports Operations and Algebraic Thinking standards 1, 2, and 5. Secret Partners addresses the Operations and Algebraic Thinking standards 1, 2, and 5, as well as standard 3 which asks children to decompose bigger numbers. Starting with 2 dots, children report the “secret partners” that make the bigger number. For 2 it is 1 and 1, but as the numbers get bigger, the possible addends increase rapidly! This activity really illustrates students using different strategies, which is another important part of dot talks. How many more to 10? 10-frames are great because they form a number-sense foundation of 10 that is easy (over time) for students to subitize. Using dots in a 10-frame, children find the missing addend to ten, Operations and Algebraic Thinking standard 4. After plenty of practice, the sum total goes up to 20! With plenty of visual support and practice, your students will master this activity. Strategies to count scattered dots addresses Counting & Cardinality standard 5. It also provides an opportunity for your students to utilize and then share different strategies for solving the dot card. Starting with small numbers, students look at how changing placement doesn’t change numbers. As the numbers get more complex, students use and share strategies to group scattered dots. Subitizing works best with well-organized dots. This activity provides a challenge. How many dots are there? with 10-frames is introduced well into the year, as the numbers start to spill into the teens. These cards can be used in conjunction with subitizing cards. Students can compare and contrast subitizing larger numbers without a frame and with a frame. 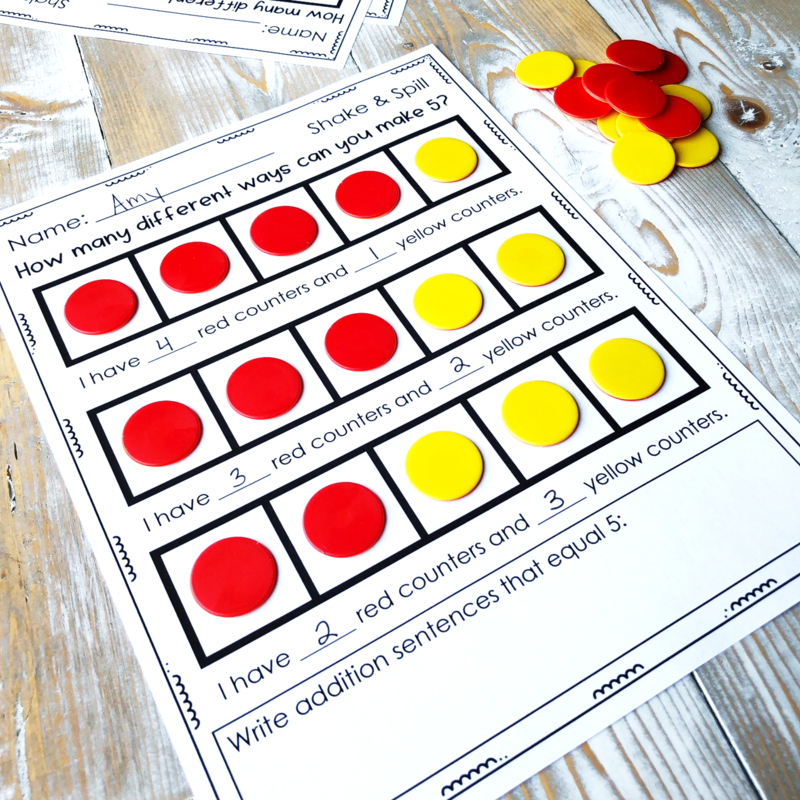 This activity addresses Counting & Cardinality standards 4 and 5 as well as NBT standard 1. Dice Dots Addition cards present dots on dice. The dots are somewhat separated and address composing numbers, number sense, and addition fluency. Children continue to build a conceptual bridge between the strategies they use for the dot cards and using formal operations. How Many Groups of 10? This activity is designed to grow with your students. Presented mid- to late in the year, students can build on their hard word developing an understanding of numbers to 100! Counting and Cardinality standard 1 is a monster, and this activity can take your students to the finish line. Students use their subitizing skills to count full 10-frames for groups of 10. It also helps children get familiar with talking about groups of 10. 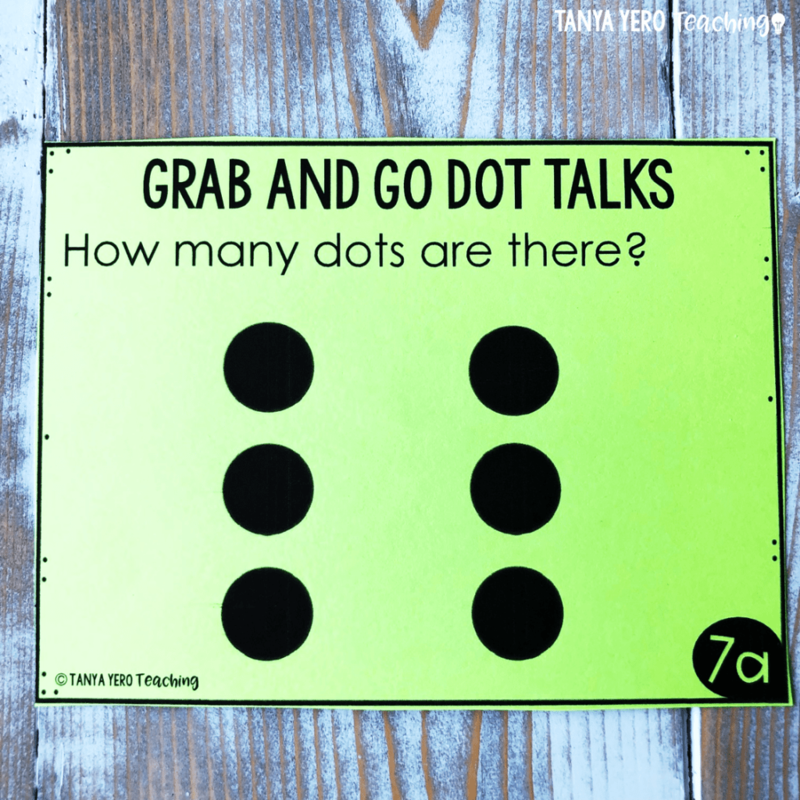 I hope these activity ideas give you a sense of how powerful dots talks and number talks can be in your classroom. 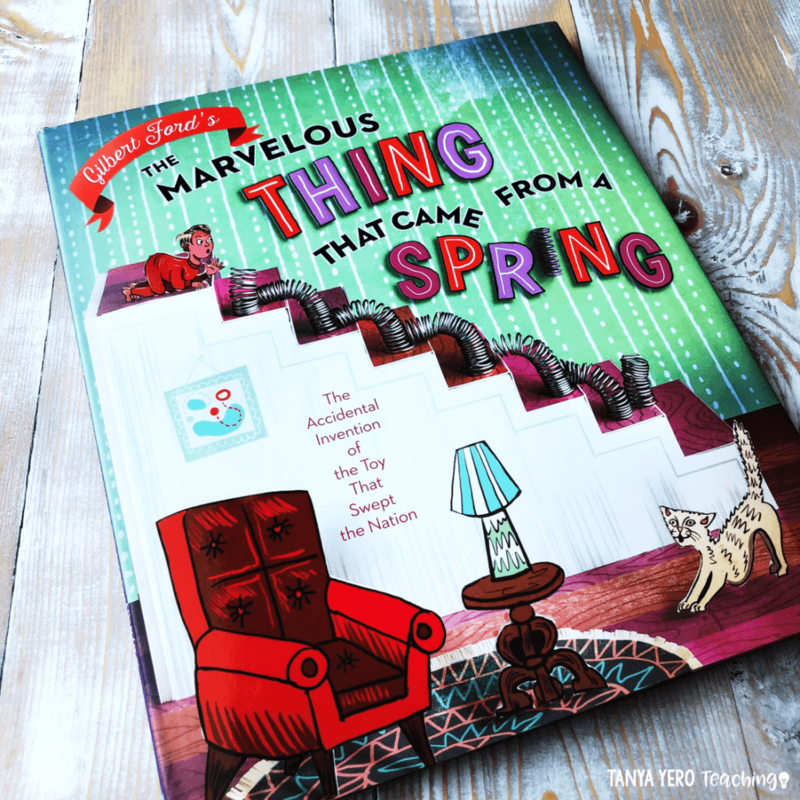 As an integrated part of your math instruction, dot talks push children’s thinking, knowing, and reasoning skills. 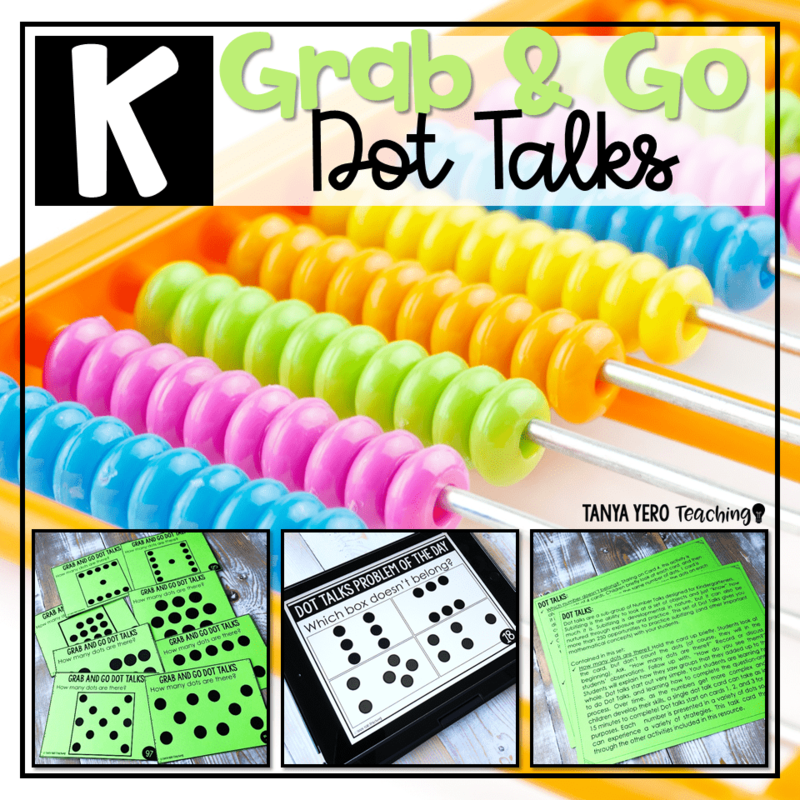 If you are looking for another math element to take your classroom math practice from great to superb, dot talks might be for you. 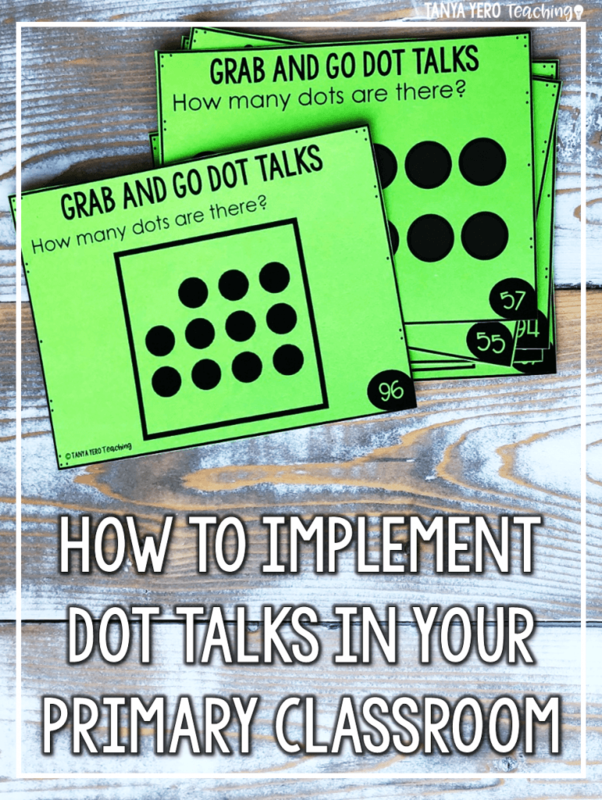 Check out our Dot Talks resource in our TpT store for print and ready resources! Primary teachers feel loads of pressure to ensure that their students are able to understand and master basic mathematical concepts. 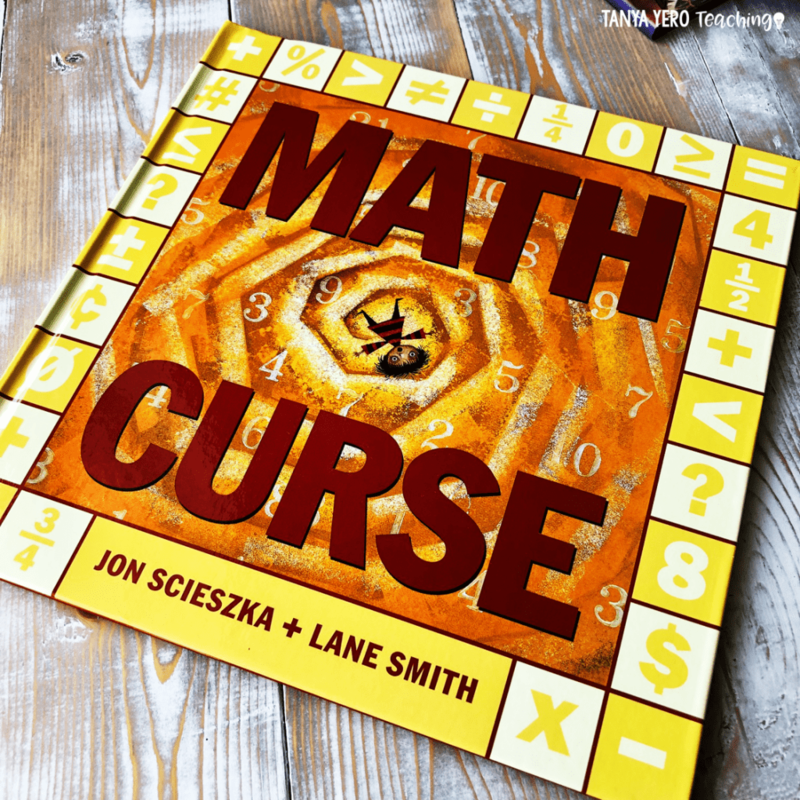 Because the subject of mathematics begins with a foundation of knowledge that builds upon itself over years of schooling, students must have a firm grasp of the foundational skills of math in order to be successful in later years. As an upper elementary teacher, I cannot tell you the number of times that I have encountered students who still do not fully understand basic mathematical concepts, such as decomposing numbers. 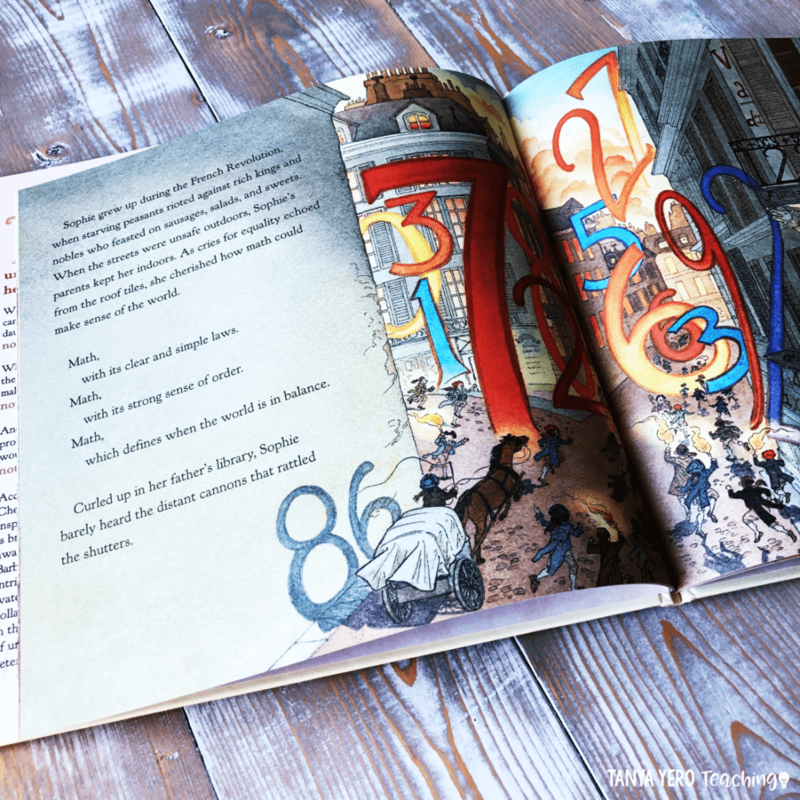 Students who struggle to add and subtract often do not have the understanding of how single-digit numbers can be broken up into even smaller numbers. This deficit not only affects their arithmetic skills, but it also affects their ability to grasp higher-level concepts, such as decimals and fractions. 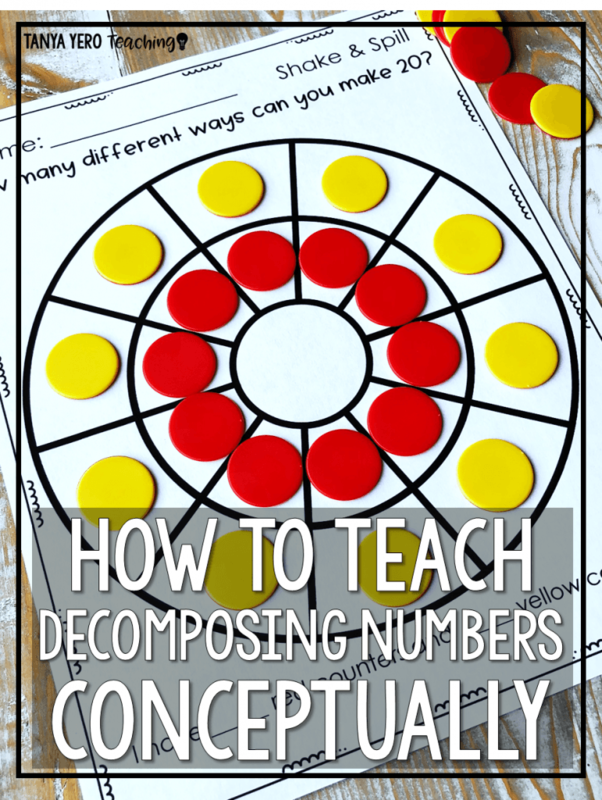 The key to teaching decomposing numbers is giving students the opportunity to play with numbers rather than simply providing a simple algorithm or forcing the ever-so-popular “skill and drill” approach to teaching. Now, you may be hesitant like I was at first to spend valuable instructional time allowing students to play with math manipulatives, but believe me, it is absolutely essential for them to be able to have this time to explore and come to their own conclusions about numbers. When students are able to manipulate objects and express their observations, their brains make more neural pathways in relation to math, which then allows them to excel in math in the future. Start with a five-frame and double-sided counters. I’ve found that it is best to laminate the five-frames so they last longer and can be easily wiped down. Give each student their own frame and exactly five counters. Have them place all of their counters on the five-frame (one in each box) and tell you what they notice. Give the students time to ponder and discuss these questions with a partner, table group, our as a whole class. Then, dive a little deeper. Notice if any of the students used both sides of the double-sided counters. Did any of them use some yellow and some red on their frame? Did any use all of the same color? It’s not time yet to get into making these into addition statements, but have them state what they did out loud. Some students may already be able to verbalize that 2 yellow and 3 red counters make 5 total, but others still need to manipulate, observe, listen, and talk about this concept without thinking of equations. Tell the students that you are going to talk more about this the next day. On the second day, give the students the same materials – a five-frame and five counters. Ask them to put one counter in each box, but this time, ask them to pay attention to the colors of their counters and see if they can come up with a different way to show five than they did the previous day. You will have varied responses to this – some students may continue to put all of their counters with the same color showing, some may do an ABAB pattern, and others may lump a few yellow together and a few red together. All of these are still acceptable for their exploration phase. This discussion will take yesterday’s lesson to the next level as they are now differentiating between the colors of the counters and recognizing that the total is still five, regardless of what colors they used. They should now be ready for the “Shake and Spill” game. You can use a recording sheet for this game, or you can continue with student discussions. Either way, the kiddos are going to get the hang of decomposing the number 5. Demonstrate for the students how to play. Take all five counters in your hands and shake them around before dropping (spilling) them on the desk. You may want to give them a small Dixie cup to shake their counters in and a small box or piece of paper for them to spill in. After shaking and spilling, they should arrange their counters on their five-frame, keeping all of the yellows together and all of the reds together. For example, if they spilled and had 2 yellow counters and 3 red counters, they would group them together on the frame rather than creating a pattern out of them. They can repeat this activity for the remainder of their math lesson, discussing their results with a partner and/or recording their work on a simple “Shake and Spill” recording sheet. Please note that if you use a recording sheet, the students will also need a yellow and red coloring utensil to record. I like to tie it all together at the end of the lesson by making an anchor chart with all of the combinations that they created. The students can then share all of the ways that they were able to make 5, and you can record them for later reference. It’s great to be able to put them in a logical order as well so that they can see the pattern in yet another way. On Day 3, you can introduce the ten-frame. Provide each student with his or her own frame. Before giving them the counters, have them tell what they notice about the ten-frame. They may state that it is bigger than the five-frame. Some students may even say that it can fit 2 five-frames. Facilitate conversation around their observations. Then provide them with ten counters. Go through the same process with having them place the counters on their frame (one in each box) and telling you what they notice. Their verbal responses will be more advanced now as they have been exposed to noticing the color of the counters. If you are hearing them chatter about their different colors, celebrate with them! They are having “ah-ha” moments and making connections to larger numbers! Again, have them discuss what they notice about the frame, how many counters they used, and how they know that there are ten counters on the frame. This helps develop recall when they see ten-frames in the future. Build on this connection by playing “Shake and Spill” with 10 counters. Again, they should group the same color counters together in order to visually see an equation prior to looking at equations abstractly. You can have them discuss their findings and observations, or you can have them record their work on a recording sheet. I prefer to transition from discussion to a recording sheet because it allows them to not only see the number relationship with manipulatives, but it gives them a chance to transfer it onto paper and then actually write out the number sentence, making even more connections for them in the process. Sign up for our newsletter to receive your FREE templates! End the lesson with another anchor chart for their reference. Many of them will notice that there is a pattern that can be made for making 10 that they saw with the “Making 5” anchor chart. 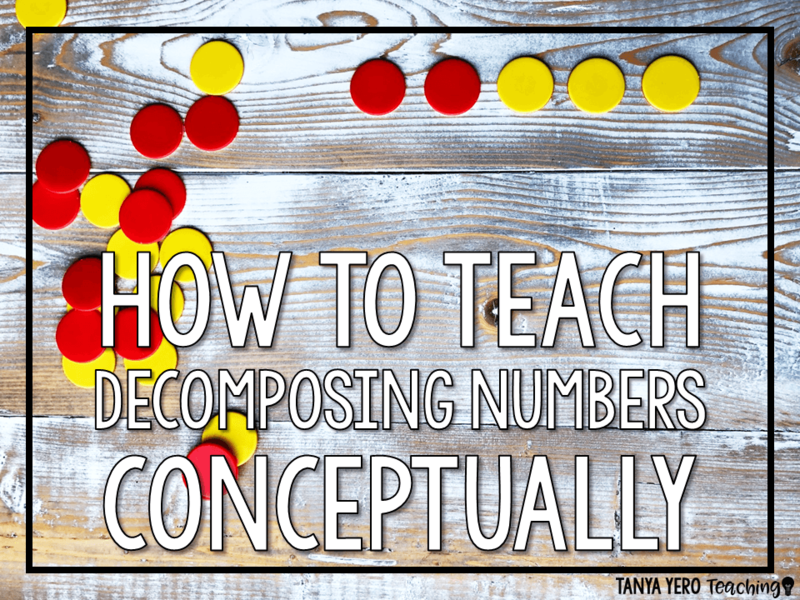 The concept of decomposing numbers is invaluable to your students and the rest of their mathematical careers. If they can make connections with single-digit numbers, you have set them up to be successful with larger numbers. 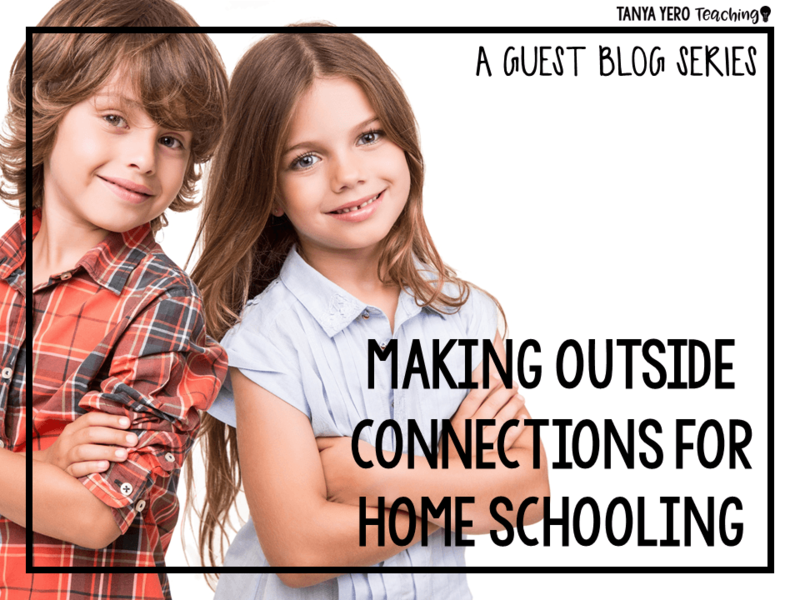 I am not really sure why people are concerned that home school students don’t socialize or make outside connections, when the exact opposite is the truth. 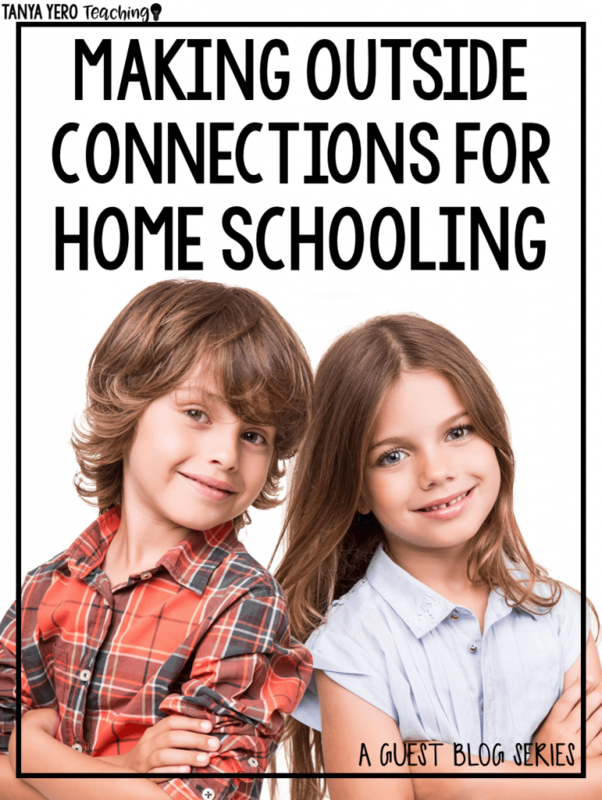 Most home school families have more options than they can manage and have to say no to activities on a regular basis to keep balance in their lives. When my oldest was in 8th grade, we joined a home school cooperative where parents teach subjects based on their skill sets and degrees in a classroom setting. Most co-ops meet one or two days per week for instruction and then complete the work at home on the rest of the days. I felt like it was important that at that age my son should learn to be accountable to someone besides me as a teacher, since that is what college would be like. I began teaching there the same year, so my other two younger children attended from earlier grades through high school. Home school co-ops often have sports teams, Beta Club, Service Clubs, and music instruction available, which provide many opportunities for your children to do the things they love with their friends. If your child loves acting, performing and the arts, there is no shortage of outlets for this love of the creative. Children’s Theatre, Children’s Orchestras and many colleges have classes and camps for these types of activities. Not only do many home school co-ops have sports teams available for students, but some states, mine included, allow home school students to try out for the sports teams in their districts. For my children, sports was their extracurricular love. All three of my children played recreational sports as young children, and then continued to play organized sports throughout high school. My oldest son played college baseball for four years. My second son played basketball for the local high school, and then went on to play in college. And, my daughter played basketball for the local high school for three years. Volunteering at the hospital is an exceptional way for a child to experience first hand whether a medical career suits him. Many students have a heart for the underprivileged and want to volunteer at the Boys and Girls Clubs as tutors, mentors and friends. Even helping to grow a community garden can be a way to give back to the community. Many students love becoming involved in local and state politics as a volunteer. I have never seen a political group who was not thrilled to have home school students join to serve, as they have flexible schedules and tend to be serious about their involvement. This can frequently lead to running for office after college for many students. 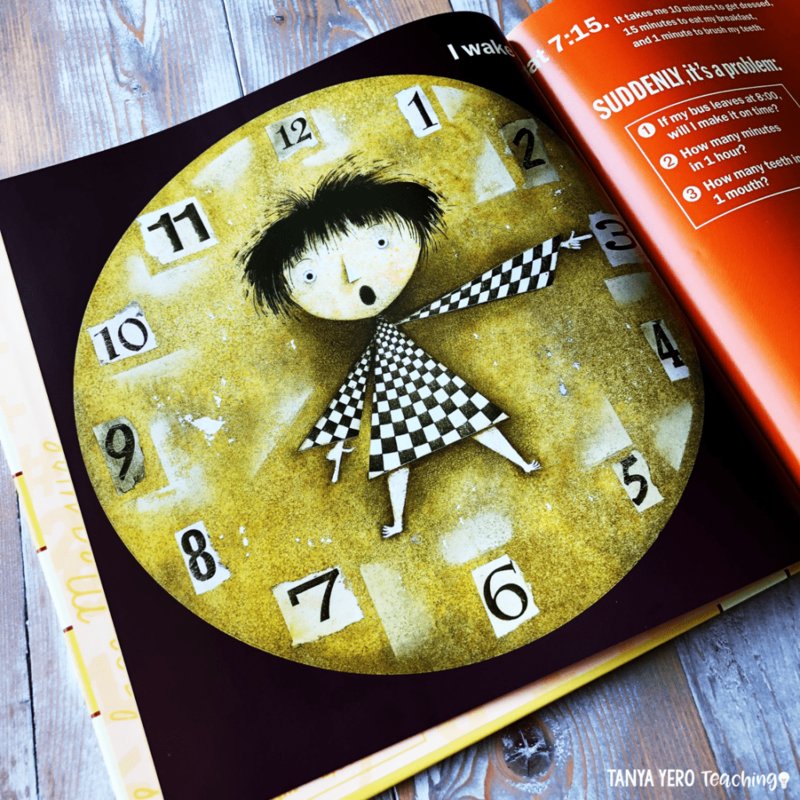 A very flexible schedule can allow many home school families to travel during the school year. Rates are cheaper and many of the experiences of traveling to other states and countries can easily be turned into something educational. A little bit of planning allows you as the teacher to incorporate these experiences into your curriculum. There are debate clubs for those who love to analyze and use logic in arguments. Engineering minded students can join robotics clubs which compete at a national level. And if there is not a group doing something of interest to your child, you can always start one! sChoosing to home school is not something to be taken lightly, and it is certainly not for everyone. I know some families who have a child in public or private school, while home schooling the rest. Many families regroup at the end of an instructional year to decide if home school is the way to go for the next year. As a parent, you must recognize that home school may not be appropriate for every one of your children. But, for those who decide to walk this road less traveled, it can be an enriching, challenging, rewarding path. Remember, you are not tasked with teaching every academic concept that exist, but rather creating life-long learners who can access information to learn limitless new things. Subscribe To Join Our Community!